I may have never believed I would get the chance, but I certainly thought it would be really cool to try. At least, I started thinking so after watching last year’s Olympics. At that time, I barely skied, but I was resolved to learn how to do it. At the end of the 2013-14 season, I picked up the basic gear and waited for this season to roll around. And has it ever been a good season for the snow! I’ve been skiing and getting better at it these last few months, but . . . biathlon? 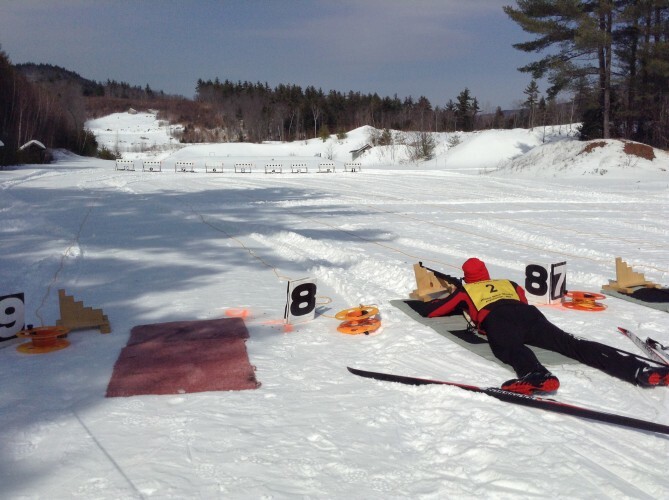 Thursday morning, a coworker e-mailed me a link announcing a biathlon at a sort-of nearby gun club sent to him by an old friend, and we talked each other into it. The main thing it had going for it was that it sounded laid-back and inexpensive. And the idea of it was pretty badass! It was difficult not to tell everyone I worked with about it. The morning dawned cold, clear, and calm. It was a beautiful day to ski and shoot. The only problem was the snow. It had warmed in the mid-week and then gotten quite cold, and the groomed snow was hard and fast . . . too fast for likes of me to ski well. I did a practice lap and fell several times. I wasn’t worried about myself so much, but the track was narrow, and I worried about getting in others’ way or taking out another skier. I told Jason, my coworker, that I was considering switching to the snowshoe race (which had two other people). He bolstered my courage and talked me out of it. A couple hours later, when we finally lined up to ski after some safety instruction and target practice, the snow had warmed up significantly, and it was much easier to ski on. I did still fall a bit on the steepest parts of the trail, but it wasn’t as bad as I feared. I didn’t ski very quickly, but that’s okay. It was really taxing—especially climbing the hills—but that’s okay, too. Why? Because nobody really seemed to care. We were all there to enjoy the day skiing and to shoot. We skied five laps and shot four times, trying to hit five targets at each shooting. Five targets, five bullets. Hit the target, and a paddle swings upward, changing the color of the target. Miss the target, ski a penalty loop. The shooting was so much fun! I wasn’t sure what to expect; the last time I shot a gun was over 25 years ago, and it was a 9mm handgun. These bullets were so small in comparison: just .22 caliber. Dangerous enough to be sure, but there was no loud crack when we shot. Nor was there any real recoil. Opening the breach to eject the shell casing spat out a wee, smoking bit of metal and a puff of burnt gunpowder. I couldn’t really tell whether I had hit anything in practice. After we were done shooting, we inspected the targets, and it turns out I had hit 5 of 5. It was considerably harder to hit the targets with my heart-rate around 170 during the race, as I learned during the first moments of the first or four shootings. I took my time. I lined up the sights, took a breath, steadied my aim, eased back on the trigger, and . . . nothing happened. I had forgotten to take the safety off after loading the magazine. With that problem taken care of, I hit 3 of the 5 targets, skied a couple laps (which took 1:30, better than the 2:00 they would have added for the misses), and set off on my second lap. I was pretty consistently hitting 60% of the targets. One lap I hit two; another lap I hit four. One of the novice skiers hit 19 of 20! When I was finishing (not quite last) Jason and his friend Nathaniel, the instigator, came to the finish line to cheer me on. No one really cared about my time, least of all me. I was happy to be done. Once I’d caught my breath, I was a little sad that the season was coming to a close and that, after the next week or two, I wouldn’t be able to practice much more skiing until November and that I hadn’t learned about this event earlier. It’s been a good year with lots of progress, and I’m really happy for the whole season, rough edges and all. Did you know? There’s summer biathlon, and I can run a lot better than I can ski. 4 Responses to I Did a Biathlon! You’ll be ready for the WY biathlon soon! Glad you had fun! Aren’t you just the most amazing thing? Every time I think you’ve reached the peak of your ability to impress me, you do something like take on two new sports, sling them together, enter a race and look great doing it. You sir, are officially a rock star. You are very kind, mon amie. Amazing! I love that I swim with a biathlete!